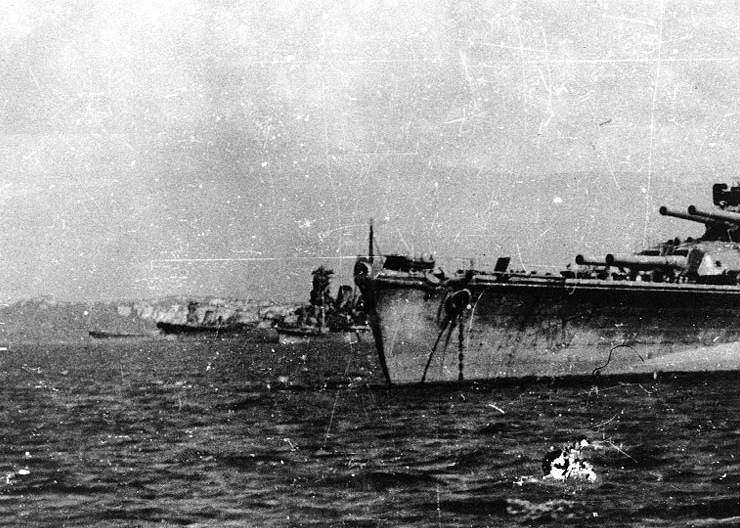 Yamato anchored at Brunei, October 1944, prior to the battle of Leyte Gulf. Pictured leftmost in the background is Yamato's sister ship Musashi, then Yamato, then a cruiser and on the right in the foreground is battleship Nagato. Source: U.S. Naval History and Heritage Command Photograph (# NH 73090), courtesy of Mr. Kazutoshi Hando, 1970. Yamato makes evasive maneuvers during operation "Ten-Go"
If you have spotted any errors on this page (Battleship Yamato anchored at Brunei) or have anything to contribute please post it on the battleship forum.